A Soroptimist delegation will join representatives of Member States, UN entities, and other ECOSOC-accredited non-governmental organisations (NGOs) from all over the world. This year the priority theme will be ‘Social protection systems, access to public services and sustainable infrastructure for gender equality and the empowerment of women and girls’. Join SI Advocacy Director, Beverly Bucur and the New York team of SI UN Representatives, Marie D’Amato Rizzi, Bette Levy, Frances Zainoeddin, Barbara Rochman, and Vanesa Treers. 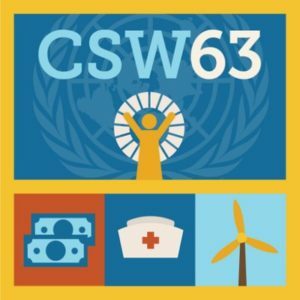 This webinar will be an interactive session with the UN Representatives from New York who will answer any questions you may have regarding the theme, advocacy opportunities and general logistics – essential for attendees of CSW63 and Soroptimists interested in Advocacy. Following registration, you will receive a confirmation email containing information about joining the webinar. Please note the time is UK time and www.timeanddate.com has a converter so you can be sure what time the webinar will be for you.